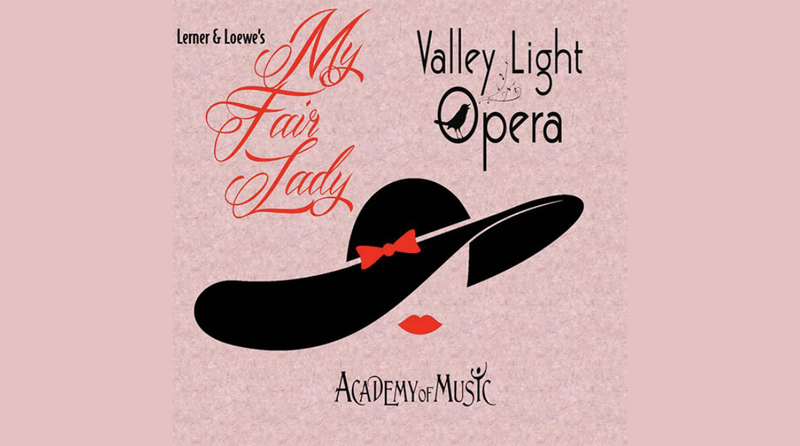 Valley Light Opera brings Lerner & Loewe’s classic musical My Fair Lady to the Academy of Music. VLO gives this old favorite a new dimension, continuing its tradition of looking deeply into the hearts of its characters and bringing them vibrantly to life as complex and fascinating human beings. Since opening in 1956, My Fair Lady has been beloved not only for its deliciously witty lyrics and enchanting music – including tender ballads, hilarious monologues, a racetrack Gavotte and boisterous barroom numbers – but also for the visual delights of the Edwardian period with swanky ballrooms, top hats, and sweeping gowns contrasting with colorful pubs and seedy streets. Critics called it “a miraculous musical” and in today’s world, its grand themes have special resonance: the clash of cultures, the relations between men and women, class resentments – and the power of love to bridge all gaps. Premium $33.50; Adults $28; Seniors $23; Student/Child $18 // Discounts for 10+ through box office.